Benoît B. Mandelbrot, a maverick mathematician who developed an innovative theory of roughness and applied it to physics, biology, finance and many other fields, died on Thursday in Cambridge, Mass. He was 85. 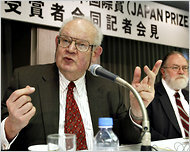 Benoît B. Mandelbrot, left, and James A. Yorke, sharing a Japan Prize in 2003 for their pioneering work in chaos theory. Graphic representations of the Mandelbrot set have been implanted in popular culture, gracing T-shirts and album covers. His death was caused by pancreatic cancer, his wife, Aliette, said. He had lived in Cambridge. Dr. Mandelbrot coined the term “fractal” to refer to a new class of mathematical shapes whose uneven contours could mimic the irregularities found in nature. For most of his career, Dr. Mandelbrot had a reputation as an outsider to the mathematical establishment. From his perch as a researcher for I.B.M. in New York, where he worked for decades before accepting a position at Yale University, he noticed patterns that other researchers may have overlooked in their own data, then often swooped in to collaborate. Dr. Mandelbrot traced his work on fractals to a question he first encountered as a young researcher: how long is the coast of Britain? The answer, he was surprised to discover, depends on how closely one looks. On a map an island may appear smooth, but zooming in will reveal jagged edges that add up to a longer coast. Zooming in further will reveal even more coastline. In the 1950s, Dr. Mandelbrot proposed a simple but radical way to quantify the crookedness of such an object by assigning it a “fractal dimension,” an insight that has proved useful well beyond the field of cartography. Over nearly seven decades, working with dozens of scientists, Dr. Mandelbrot contributed to the fields of geology, medicine, cosmology and engineering. He used the geometry of fractals to explain how galaxies cluster, how wheat prices change over time and how mammalian brains fold as they grow, among other phenomena. His influence has also been felt within the field of geometry, where he was one of the first to use computer graphics to study mathematical objects like the Mandelbrot set, which was named in his honor. Benoît B. Mandelbrot (he added the middle initial himself, though it does not stand for a middle name) was born on Nov. 20, 1924, to a Lithuanian Jewish family in Warsaw. In 1936 his family fled the Nazis, first to Paris and then to the south of France, where he tended horses and fixed tools. After the war he enrolled in the École Polytechnique in Paris, where his sharp eye compensated for a lack of conventional education. His career soon spanned the Atlantic. He earned a master’s degree in aeronautics at the California Institute of Technology, returned to Paris for his doctorate in mathematics in 1952, then went on to the Institute for Advanced Study in Princeton, N.J., for a postdoctoral degree under the mathematician John von Neumann. After several years spent largely at the Centre National de la Recherche Scientifique in Paris, Dr. Mandelbrot was hired by I.B.M. in 1958 to work at the Thomas J. Watson Research Center in Yorktown Heights, N.Y. Although he worked frequently with academic researchers and served as a visiting professor at Harvard and the Massachusetts Institute of Technology, it was not until 1987 that he began to teach at Yale, where he earned tenure in 1999. Dr. Mandelbrot received more than 15 honorary doctorates and served on the board of many scientific journals, as well as the Mandelbrot Foundation for Fractals. Instead of rigorously proving his insights in each field, he said he preferred to “stimulate the field by making bold and crazy conjectures” — and then move on before his claims had been verified. This habit earned him some skepticism in mathematical circles. Besides his wife, Dr. Mandelbrot is survived by two sons, Laurent, of Paris, and Didier, of Newton, Mass., and three grandchildren. When asked to look back on his career, Dr. Mandelbrot compared his own trajectory to the rough outlines of clouds and coastlines that drew him into the study of fractals in the 1950s.